- Great East End location. - Open concept living/Great Room, kitchen and dining. - Massive windows and tall ceilings - tons of natural light. - Rooftop deck jacuzzi with 360 degree views. - Spacious main living area. 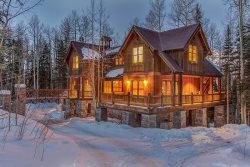 - Truly incredible views of Ajax, Ingram Falls, Bear Creek, Downtown Telluride, and the Ski Area. - Downstairs media room with large flat-screen TV. - Large entry/ mudroom with cubbies and storage for coats and gear. - Wifi and Bluetooth Sound system throughout the house and rooftop deck. - Full bed with an additional two sets of twin bunks (5 total beds). - Adjacent shared bathroom with shower/tub combo. We were very please with our experience with Latitude 38. The customer service was excellent and the rental was very clean with beautiful views.